Cofelia’s Stockings | Barbie Who? 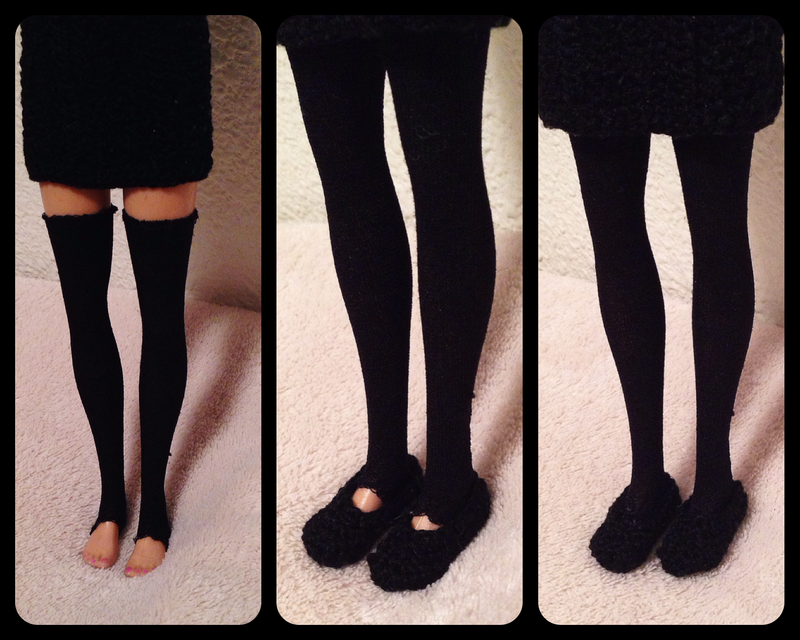 These stockings have been a headache, but I finally managed to finish them. Yay! I created them using this great tutorial by Adam’s Doll-Related Blog. His looked more polished, but mine will work for Cofelia’s look. The biggest difference between his stockings and the ones I made is that mine are open toed. Because it is quite different, I will post a few pictures of the process. 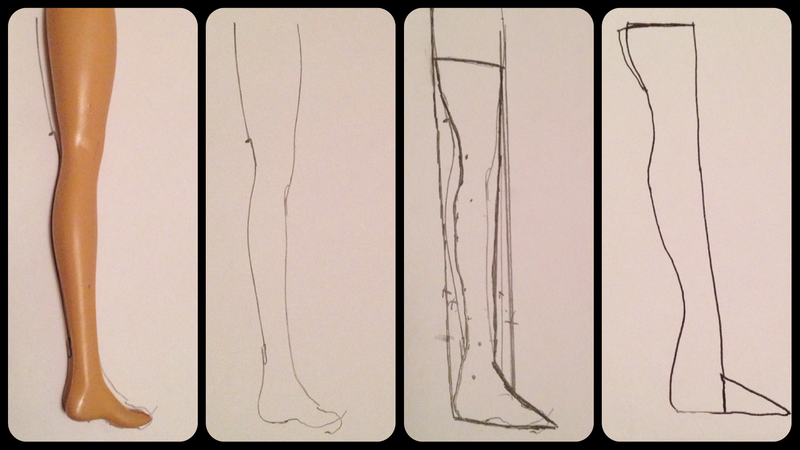 First I traced the leg, just as the tutorial said. Then I cleaned up the lines and drew a few guiding lines. I couldn’t draw a proper line from the toe to the thigh because Cofelia’s feet are too big. Instead, I drew a line from the ankle and worked with that line to create an open toed sticking. After playing around and creating a few lines for the shape of her leg, I inked the finished stocking pattern onto a fresh piece of paper. From there, I traced the pattern into the stabilizer. Pro tip: use a different color than the thread you are using to sew the item. I used a black pen and black thread, and it was hard to see. If I do another pattern, I will use ink that contrasts so that I don’t strain my eyes while sewing. Trust me, just don’t do it. This next part is where I made another mistake on the first stocking. First, I forgot to attach the lace to the top before sewing the long side-seam to the stockings. I had to undo half an inch of tiny stitches so that I could go back and fix it. After fixing that, I cut and sewed the edge for the open toe with a blanket stitch and used a back stitch to sew the long seam. After that, I trimmed the fabric, ripped off the stabilizing paper, and turned it right side out. At this point, I tried putting it onto Cofelia’s leg. I then realized that the lace didn’t have as much stretch as the stocking fabric, so I had to rip it off and re-sew the top edge. From there, I was able to get the stocking on. With my newfound experience, I sewed a second stocking in half the time it took for the first one. The second one did have a slight problem with the stabilizer not wanting to release. There were several days between when I attached the stabilizer and when I ripped it off, and I believe this is to blame. The box says that the stabilizing paper releases best when it is attached to the fabric for an hour or less. Oops! Next time I will read closer before starting a project. 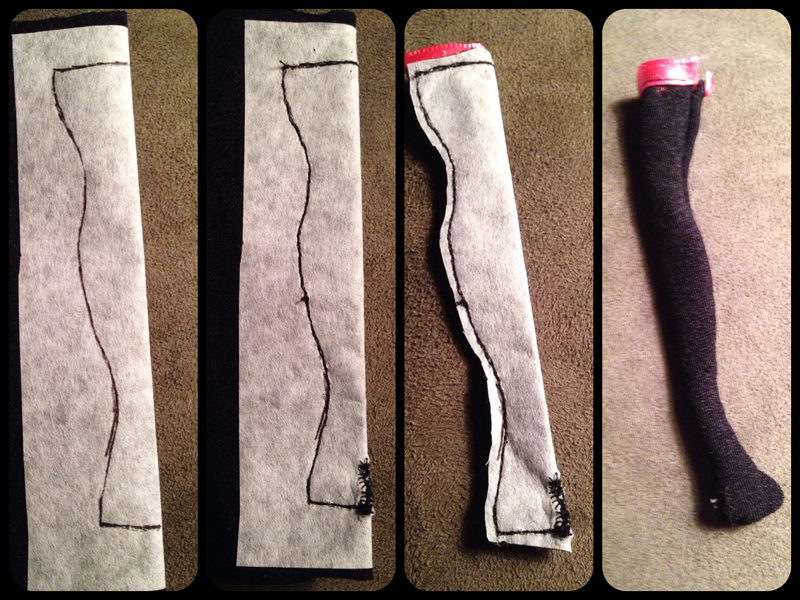 Still, there weren’t any noticeable runs in the finished stockings, so I don’t need to make a third one. I am so happy with how it looks! The shoes fit over the stockings, too. It is a big relief knowing I won’t have to make another pair. The only problem was that the open toe part was big enough to leave a gap of skin. I used a crochet hook to pull the stockings down and secure them to the shoes, eliminating this problem. It does slip at times, but for regular play it won’t matter. I did the easy fox just for pictures. The baby adipose are very happy with how their matron looks. They do still enjoy causing a bit of trouble, though. This leaves one final detail before Cofelia is finished: her hair. I am going to style her hair and take some finished photos! I am ecstatic; the end is so close I can taste it.